Cast members Roseanne Barr, John Goodman, Sara Gilbert, Michael Fishman, Sarah Chalke, Emma Kenney and Jayden Rey, along with executive producer Whitney Cummings, attended a special screening event for “Roseanne” fans on Friday, March 23, at The Walt Disney Company lot in Burbank, California. 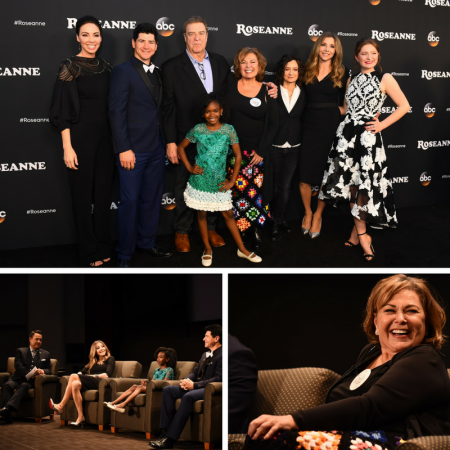 Following an intimate Q&A session moderated by KABC’s George Pennacchio, fans of the beloved comedy were able to meet and mingle with the cast and executive producer before enjoying a screening of the premiere episodes. ABC’s highly anticipated revival of “Roseanne” premieres with back-to-back episodes, TUESDAY, MARCH 27 (8:00 – 9:00 p.m.). Iconic comedy series “Roseanne” returns to The ABC Television Network on Tuesday, March 27, at 8 p.m. EDT, with nine new episodes featuring the complete original cast – Roseanne Barr, John Goodman, Sara Gilbert, Laurie Metcalf, Michael Fishman and Lecy Goranson. Sarah Chalke, who played the character Becky in later seasons, will also appear in another role. New cast joining the one-of-a-kind Conner family includes Emma Kenney as Harris Conner-Healy, Ames McNamara as Mark Conner-Healy and Jayden Rey as Mary Conner. With fresh stories that tackle today’s issues and even more laughs from a brilliant cast and crew that haven’t missed a beat, audiences old and new will celebrate the homecoming of America’s favorite working-class family. The original run of the series broke new ground through the authentic and relatable lens of the Conner family, barely scraping by in the fictional town of Lanford, Illinois. It also dominated the ratings as one of the highest-rated television series on the air for its near-decade run. This time around, the Conners continue to face the economic challenges of living paycheck to paycheck, with a sense of the absurdity of it all. With the inimitable Roseanne at its epicenter, the revival will explore life, death and everything in between, with the humor, relevance, warmth and brutal honesty that audiences appreciate. Fan-favorite guest stars from “Roseanne” will reprise their roles in the revival, including Estelle Parsons as Beverly Harris, Sandra Bernhard as Nancy Bartlett, Natalie West as Crystal Anderson, James Pickens Jr. as Chuck Mitchell and Adilah Barnes as Anne Marie Mitchell. Additionally, Christopher Lloyd guest stars as Bev’s boyfriend, Lloyd.